Are these displays simply too good to be true? Do you fancy a big monitor? 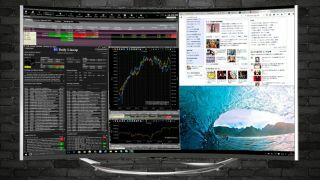 And we mean a really big monitor, because JapanNext has unleashed a pair of monster curved 4K displays aimed (partly) at being hooked up to PCs for productivity use – and they don’t cost the earth, either. The JN-VC490UHD and JN-VC550UHD are 49-inch and 55-inch monitors respectively, which are being pitched from multiple angles: living room use, gamers, as well as productivity. If you need a copious amount of screen real-estate for multi-tasking and professional/industrial use, then obviously this is a neater alternative to having multiple monitors. As mentioned, gamers might also be tempted by these curved 4K screens, as they’re obviously going to give you a pretty breath-taking experience when playing the latest shooter (or whatever’s your gaming poison). Particularly given that these displays have AMD’s FreeSync on board to combat stuttering and tearing. The monitors offer a resolution of 3840 x 2160 with a 60Hz refresh rate and a 3ms response time (4ms for the larger screen – again, that’s still pretty tidy for gaming). These are 10-bit SVA panels with 99% coverage of the sRGB colour gamut. As Ars Technica reports, the monitors use ELED backlighting which means they are flicker-free to be easy on the eyes when used for long periods of work. You get full picture-in-picture and picture-by-picture support, and connectivity includes a DisplayPort 1.2, HDMI 2.0, and a pair of HDMI 1.4 ports, alongside a legacy VGA connector. In total, you could hook up four PCs to the display with a Full HD picture for each. There’s also a built-in USB hub and integrated 6W stereo speakers. Both these monitors are currently only available in Japan, and as mentioned, they don’t carry wallet-destroying prices. The larger 55-inch screen is priced at around $870 (around £700, AU$1,135), and the 49-inch display runs to $725 (around £585, AU$945). JapanNext does sell products in Europe, so fingers crossed we’ll see a launch of these giant screens over here.